All the final day tension that could have been mustered was all too readily available at the lower ends of Divisions 2B and 2C. Belfast Harlequins and Dungannon, in 2B, and 2C's Bangor were each facing defining moments in order to reach safety from the dreaded drop zone. They all managed it but not without a few unexpected twists along the rocky road to safety. For Bangor the situation was especially perilous as they arrived at last weekend off the back of 10 consecutive losses and were still vulnerable to finishing bottom of the table and being automatically relegated back to junior rugby. The Upritchard Park club not only needed to beat Malahide - who were already guaranteed at least fourth and a promotion play-off - but also required either Tullamore or Seapoint to lose with the latter club hosting bottom side Thomond and clearly favourites to prevail. It all looked rather unlikely but Bangor kept their part of the deal intact by ending their double digit run of defeats with a 25-19 result at wind-battered north Down. 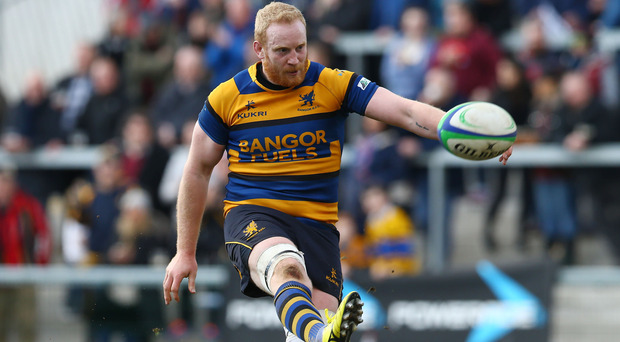 First-half tries from David Bradford and Adam Alexander had put Bangor 20-0 up before Dave Caughey's later effort got them there after Malahide had worryingly closed it to 20-19. Even so, ninth place and a play-off to stay in the AIL looked to be on the cards for Bangor until Thomond pulled off a last-gasp win at Seapoint which meant the Ulster side ended up in eighth, rightly prompting huge celebrations at Upritchard Park over their great escape. More wriggling off the hook was performed by both Quins and Gannon in 2B. The smart money had been on Quins handily beating Galway Corinthians and rescuing the Tyrone side, who were at fellow strugglers Skerries, from potentially needing to win away. But, as things turned out, it was Gannon's dramatic 24-22 victory over their hosts along with the losing bonus point Quins dug out in going down 11-10 to Corinthians which brought both Ulster clubs to the safety of higher ground. Gannon had been trailing 22-0 at a wind-lashed Holmpatrick before James McMahon's try began the comeback drama, the four points lifting Gannon up to close their campaign in fifth. Quins had trailed 5-3 after their opening half against Corinthians who also needed to win to escape ninth spot. Though Quins managed a Daryl Marshall try and Paul Kerr conversion in a wind-assisted second half, the Connacht side edged the affair to finish in sixth while Quins dropped from there to hang on to eighth courtesy of Gannon consigning Skerries to ninth and the play-offs. Also in 2B, Rainey Old Boys rested key players ahead of their promotion play-off with Greystones and, as such, were turned over 50-10 at home to champions Barnhall who ended their season having won all 18 games. Oisin Quinn scored Rainey's only try with their other points from the boot of Scott McLean. Omagh's slim hopes of breaking into 2C's top four came to nothing despite tries from Scott Elliott and Eoin Murnahan allowing them beat champions Ballina 19-7. The Accies had to content themselves with a fifth-place finish while sixth-placed City of Derry, with nothing to play for, lost 24-18 at Tullamore. In 2A, Queen's University made it seven wins in a row as they prevailed 43-31 at Old Crescent ahead of this weekend's promotion play-off at Buccaneers, though the students came within one point of snatching third spot from Navan and meeting Cashel in the knockout stages. By Michael Sadlier Both Queen's University and Rainey Old Boys have opportunities to advance themselves towards promotion from Divisions 2A and 2B respectively as they hit the road for today's play-off semi-finals. by michael sadlier City of Armagh can carve out a piece of history for themselves should they lift the All-Ireland Bateman Cup in today's final against Garryowen in Dublin (kick-off 12.30pm). By Michael Sadlier There was to be no denying Ballynahinch their moment.